My name is Mrs Irene Henshaw and I worked at Rushworth and Draper from 1937 (when I was 18 years old and my name was Miss Platt) to 1941 when the war meant that I had to leave to work at the Ministry of Food. Rushworths was a very significant part of my young life in Liverpool and I have very fond memories of my job there and the many characters I worked with. My first role was in the organ works on Great George Street – a marvellous place. I remember the apprentice organ builders and George Hutchins the Manager of the organ works who tested them. I recall sitting alongside him on the organ bench while he played, urging him to ‘swing it’ a bit! The men were highly skilled craftsman – my bosses Mr Rackham and Mr Parker were university graduates. Every room contained organ pipes and the various elements that went into the build – it was very complicated. When the war came, the organ works was closed because it was felt that organs were luxury items and there would be no call for them. The Sheet Music Department was also a very important part of the business. When the organ works closed, I went to work in the shop on Islington where they sold radiograms, I then worked in the publicity department – scouring the newspapers for any reference to Rushworth and Draper and keeping the cuttings – and I also worked for a short spell in the basement trying to sell, would you believe, washing machines and industrial sized ironing boards! This idea was Mr James Rushworth’s – he thought it would be a money spinner but it didn’t work. I also remember Maynard Rushworth who gave piano lessons. One of my friends was Miss Rae Davies who worked in the Box Office managing all the ticket sales for shows around the country and for the Liverpool theatres too. 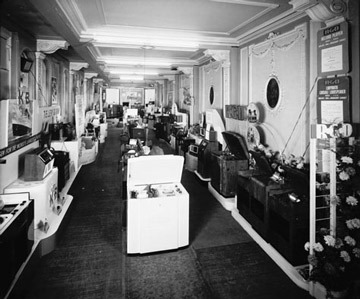 Miss Davies shared the Box Office with a parrot that greeted customers – a company gimmick – it used to irritate her terribly. As well as serving all things musical, Rushworths had a strong connection with the theatres and with visiting actors. Rushworth Hall was used by artistes for rehearsals and many famous names of the day passed through the doors including Michael Redgrave; Malcolm Sargent was also a regular visitor. Rushworth’s cared for their employees – although the pay wasn’t brilliant. As well as a staff restaurant serving excellent food, there was a rest room for female employees who might have a tummy ache and need a hot water bottle and a lie down. There was also an annual company sports day.